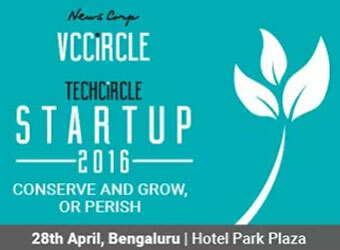 The Bengaluru edition of Techcircle Startup 2016, to be held on April 27-28 at Park Plaza Hotel, is all set to enthrall stakeholders of India's thriving startup ecosystem. The event will have an impressive line-up of speakers, special addresses, pitching sessions and plenty of opportunities for investors and entrepreneurs to connect with each other. Techcircle Startup, which is India's largest startup event, will bring together cutting-edge and disruptive early-stage startups, current and potential investors, angels, seed funds, incubators, accelerators and mentors. Many of India's most active VC/PE funds will also take part in the event. The conference will be your ultimate guide to the startup ecosystem in and around Bengaluru. It will also address the crucial question of startups surviving in a fund-constrained environment. If you have not registered yet, this is your last opportunity to do so as seats are almost full. Register now or write to Kanika at register@vccircle.com/ or call 0120-4171111. Day 1 (April 27) A guided tour of the offices of India's top venture capital funds, leading startups and key companies in Bengaluru for an interactive session with the top management. Participants will get to interact with the team, see how the companies function and learn directly from some of India's best entrepreneurs. 09.30am - 10.15am Panel 1: Growth Models for start-ups: Building scale in the challenging funding environment With easy money phase coming to an end, the scope of building large user base by burning millions of dollars in the hope of future profits becomes increasingly limited. Can startups adopt sustainable business models without compromising on growth? Will existing venture capitalists help them in tough times? 11:15am- 12:00pm Panel 2: Getting the most out of investors, beyond their money Investors possess not just capital, but a wealth of experience, expertise and network as well. How well are startups making use of them? Can investors, with their ability to offer strategic and tactical advice, help startups become capital efficient? 12:00pm - 12:45pm Panel 3: Starting Up For A Cause: Can startups bring about social change? Digital technology and innovation can change lives and bring about great socio-economic transformation. Who knows this better than startups who have disrupted traditional industries and placed people at the core of businesses? This panel brings together entrepreneurs who have built businesses that strike a balance between profits and social good. From promoting sustainable development to bringing accountability in governance processes and pushing for inclusion in a largely fragmented social landscape, these startups have walked the extra mile in making lives better. What drives them to commit to social good? 01:45pm - 02:30pm Panel 4: Women Entrepreneurship and Startups: Will women lead the next set of unicorns? How synonymous have women and startups been? While mature industries in India have seen significant contributions from women, how has the startup ecosystem embraced women entrepreneurs? How open are startups in accepting them? Can we envision an ecosystem where the next set of Indian unicorns arrive under the leadership of women? 03:00pm - 03:45pm Panel 5: The art and science of customer acquisition and retention There is a limit to burning cash to earn customers. In any case, that option is almost non-existent now. What are the smart practices to win and retain customers? The larger question is: what level of burn rate can a startup afford? 03:45pm - 04:15pm Meet Up Session (Parallel Session) If you feel you've captured your business idea well, got the basics right, have the founding team in place and are now ready to bounce off your startup idea with prospective investors, do write to us along with a wish list of investors you would like to pitch to. If selected, you will be invited to showcase your business idea to a clutch of investors in person. 04.20pm - 05.00pm Panel 6: Nurturing talent in a constrained environment As startups brace for the challenging future by cutting costs and reducing their footprint, professionals and employees working with these companies are faced with uncertainty. With startups consolidating and rationalizing, do we see these ventures going the extra mile in devising a policy framework to nurture and retain talent in tough times? How can startups hire the best talent in spite of funding constraints and retain it for the longer run? 05.00pm - 05.30pm Techcircle Showcase It is a curated platform for innovative startups to make an elevator pitch to a select jury of angel investors, venture capitalists and fellow entrepreneurs. This is also a platform of choice for early stage, pre-revenue startups for attracting investor attention. To take part in the event, register now or write to Kanika at register@vccircle.com / or call 0120-4171111. For branding and sponsorship opportunities, write to sponsorship@vccircle.com.